Ooo...looky! Little green leaves! Ok, it isn't really that impressive. That is a whole week of growth. 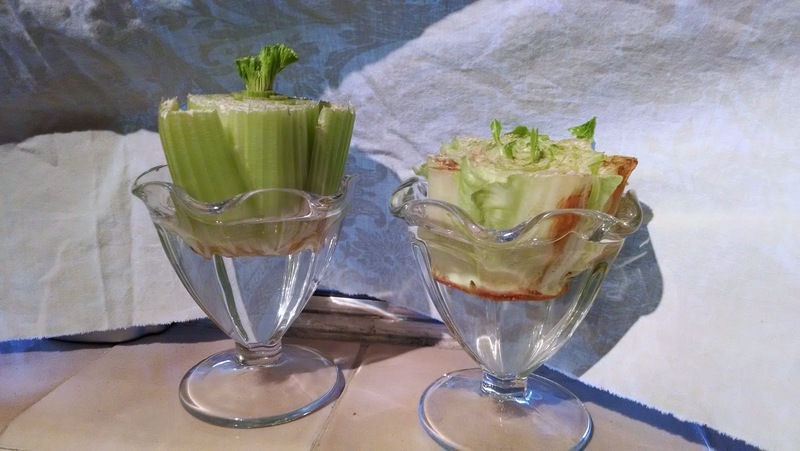 I certainly won't be living on windowsill lettuce and celery. I think the outer leaves are decaying as fast as the inner leaves are growing. That kind of cancels each other out. They still look kind of cute in their sundae cups though. It's probably a better use for those cups anyway. My diet is going well and I'm slowly shrinking. The weather has been in the 80's and it is getting too hot to walk at lunch. I'll have to ride my exercise bike after work instead. I should take the dogs for a walk but after having run in to more than 3 loose and unfriendly dogs while walking, I am a bit scared to go. I don't think I can handle 3 dogs on leashes and a big stick. I need more hands. Yum, you will never have to shop again!! Maybe if I was a grasshopper, no, they eat too much. An aphid?